With its artfully dishevelled hippy bars, laissez faire attitude and easy access via its international airport, Phuket is typically viewed as one of Thailand’s more commercialised backpacker destinations, but don’t let that deter you. Often overlooked by luxury-seeking travellers in favour of Koh Samui or Krabi, Phuket offers a wealth of culture, activities, fine dining and 5-star luxury retreats alongside its sweeping golden-hued beaches. From the palm-framed zen gardens of Khao Lak’s The Sarojin to Sri Panwa’s hilltop penthouses perched high on Cape Panwa, here are five resorts for every kind of traveller, from couples in search of romantic getaways to adventure-hungry adrenaline junkies. 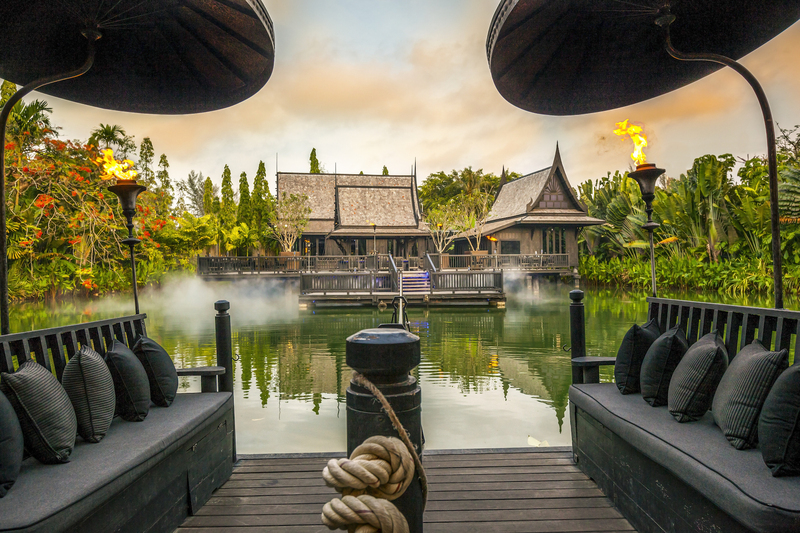 Nestled on the beach of Khao Lak, just over an hour north of Phuket International Airport, The Sarojin Boutique Beach Resort is named after a Thai nobleman’s daughter whose hospitality became the stuff of legend. On arrival, guests are greeted in the imposing, traditionally appointed lobby with a cool towel and a signature drink flavoured with savoury-sweet pandan leaves. Gazing across the lotus pond, the atmosphere is one of stillness and calm, and depending on arrival time, guests may find themselves serenaded with the jaunty whistle of the common dark-plumed myna, or a chorus of croaking frogs, accompanied by the gentle rush of the sea. Since opening in 2005, one year after the devastating tsunami, the hotel has become enveloped in foliage, giving the site the feeling of a garden gone wild. The pool sits in a cluster of trees, with the accommodation partially concealed from the main lawn, and at the second restaurant, Ficus, an extensive all-day breakfast menu is served with sparkling wine at tables overlooking the glittering pond. The garden residence rooms are the epitome of traditionally-influenced Thai luxury, with teak furnishings, cool white linens and elegant fittings. It’s the bathrooms, though, that surpass all expectations. Part decadent washroom, part zen garden, the space is divided into a sink and wardrobe area, similar in design to the main room, and a pebble-floored wetroom with a rain shower, an adjustable shower, a huge stone bathtub (filled with scented water and petals before your arrival) and wooden beams across the ceiling, between which there is almost nothing between you and the sky. 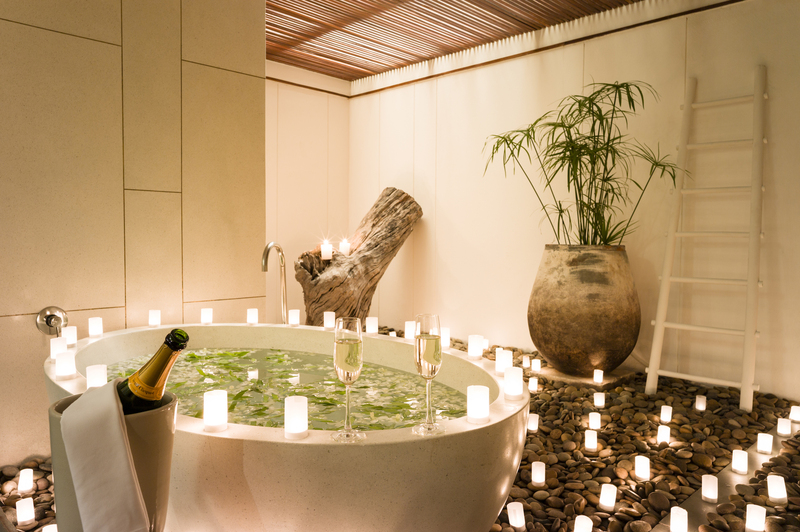 A word of warning to the honeymoon market: there is no partition between the zen garden area and the toilet, so if you’re not comfortable with that level of intimacy, you’ll have to arrange some kind of bathroom rota (and get used to it – open toilets are pretty standard in Thai bathrooms). Rooms are named after employees who helped the community recover after the tsunami, and their pictures hang inside, but The Sarojin itself is also active in the local community, having started The Sarojin Khao Lak Community Fund to support local projects such as the orphanage, medical provision and helping to restore the fishing fleet. Guests can visit these projects as one of the many experiences and activities that the hotel offers. The Sarojin is the ideal place to spend a secluded holiday with someone special; one can draw the curtains on some poolside daybeds, recline outside your own room, or stay inside. If you want to venture further than the immediate vicinity of your residence, the Lady Sarojin boat can be hired for island hopping, SCUBA and snorkelling excursions. Alternatively, cultural trips can be arranged within the local community or you can do extreme trekking, swimming, rock climbing or be an Elephant mahout for the day, which we were lucky enough to experience at Phang Nga Elephant Park. If you have your heart set on the bustle of Phuket, The Sarojin might appear too far off the beaten path, but Khao Lak and Phang Nga have their own charms with their proximity to several national parks. Hotel Manager Kade and his staff have created an environment that epitomises luxury seclusion; you can even book your own ‘imagineer’ who will make every effort to make your dream itinerary a reality. 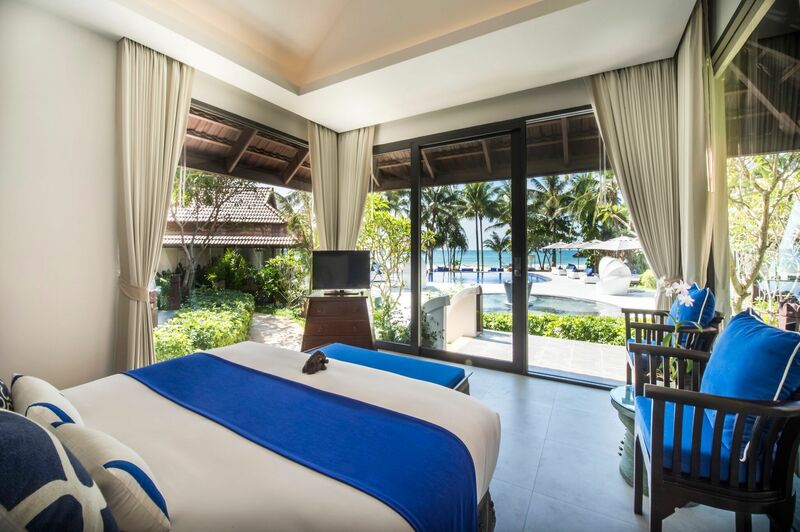 Between 1 Nov 2017 and 15 Apr 2018, rooms at The Sarojin start from THB 12,984 / approx GBP 282 per room, per night, based on 2 people sharing. Between 16 Apr 2018 and 31 Oct 2018, rooms start from THB 6,874 / approx GBP 153 per night. These rates are inclusive of all-day a la carte breakfast with sparkling wine, served until 6pm, and all taxes. Just a few minutes south of the airport in Phuket, The Slate is a real treat for the design conscious. If you tell someone that you’re staying at The Slate, those with their fingers on the luxury travel pulse will recognise it as the new incarnation of the famous Indigo Pearl resort, but the recent refurbishment has swept aside the aging decor and replaced it with an exciting combinatio­n of quirky industrial references to the local tin mining history and authentic Thai style. Tin, known as ‘black gold’, was abundant in Phuket, with the ore often being found alongside slate, and tin mining was a key industry and wealth creator for the area throughout the last few centuries. One of the descendants of a major mining family, Wichit Na-Ranong, is now the owner of The Slate and it was his interest in his family history that motivated the rebranding of the hotel. Hav­ing enlisted internationally acclaimed architect Bill Bensley, The Slate has really raised the bar for contemporary design in Thai luxury travel. The lobby is an eclectic mix of salvaged tin mining relics and coloured glass mobiles, all set against cool grey stone. Bright heliconia flowers are somewhat of an emblem and pop up in unique arrangements around the hotel – they even have a gallery dedicated to these designs. Our pearl bed suite was a three minute walk from the main building but very convenient for access to the big adults-only pool, distinct from the family pool in that the bar is swim-up rather than tucked around a corner (a third pool is for ages 14 and up, providing a nice haven for those who have slightly older children) and the depth is quite sufficient for a proper swim. The room has the same eclectic design that characterises the rest of the hotel, with royal blue and grey furnishings against more stone walls. An enormous day bed and oversized stone bath sit on the ample balcony which, despite its marvellous treetop views, was completely shielded from the view of other guests. Thoughtful touches, such as industrial wheels for the taps and custom-made tin vessels for the toiletries, were reminders of the attention to detail that has gone into this refurbishment. It would be quite possible to spend a week or two at The Slate without leaving the property. 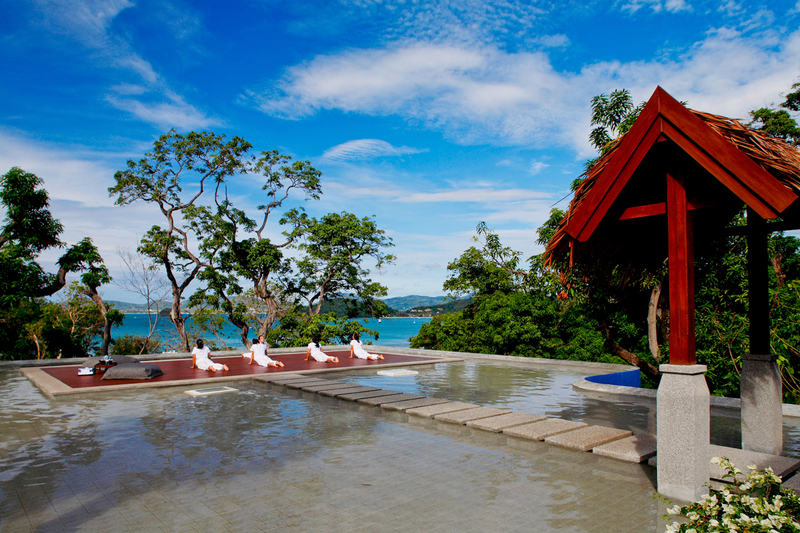 There are many activities available; private dinners can be organised on the beach, the Nai Yang Sea Bees Diving Centre offers marine exploration from snorkelling to advanced SCUBA sites, and there are facilities for tennis, yoga, sea sports, biking and Muay Thai (Thai boxing) classes. There are several bars, including the very chic Rebar and the Tonkah Tin Syndicate sports bar (which has pool tables, sports on TV and a potentially dangerous free-flowing local rum offer on Thursday), and restaurants, including Black Ginger, Rivet, Dirty Monstera and – for the health conscious – the Underground Café. Offsite, there are cultural activities, such as visiting local temples and visiting the markets of Phuket town. For those passing through Phuket and looking for a design-led resort with the wow-factor, The Slate delivers on style and substance. Rooms at The Slate start from THB 7,800 in the Green Season and THB 8,000 in the High Season. 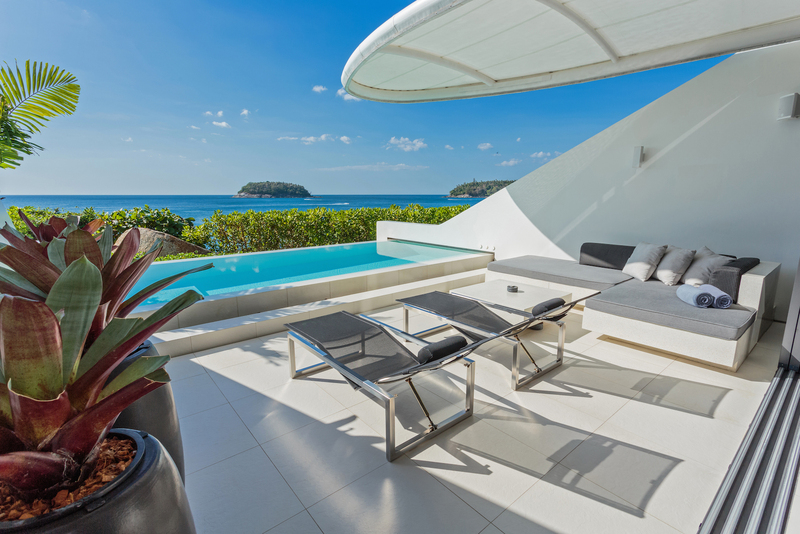 Sri Panwa is one of the top properties in Thailand, perched high atop Cape Panwa and commanding breathtaking views of the Southeastern tip of Phuket, occupying the Cape Panwa peninsula in its entirety. The villas sit 40-60 meters above sea level along the Eastern and Western ridges at the very tip of the cape, each offering a staggering vista of the surrounding islands and Andaman Sea. Inside, the interiors embrace tropical contemporary design, integrating the natural jungle and ocean surroundings with the modern comforts of luxury living. The villas are designed to feel like private homes, incorporating the finest bed linens, customised toiletries, gourmet mini-bars and traditional handcrafted furnishings. Our penthouse was made up of 140 square metres of refined living space as well as a private infinity pool to enjoy the ocean views. Having a dining and living area to ourselves, along with a full fridge and kitchen space, meant that we were able to chill out in the suite at our leisure, making full use of our beautiful surroundings. The site on first encounter seems vast – you can hail one of Sri Panwa’s tuk-tuks to whizz you around the complex – but most facilities are walking distance. Worth checking out is Baba Poolclub, home to a 25-meter infinity-edge lap pool, pool bar, BabaQ Dining, a games room, disco and boutique. The poolclub is where most guests hang out during the day, while Baba Dining Lounge offers an intimate Thai dining experience, serving signature soul food accompanied by sunset views. 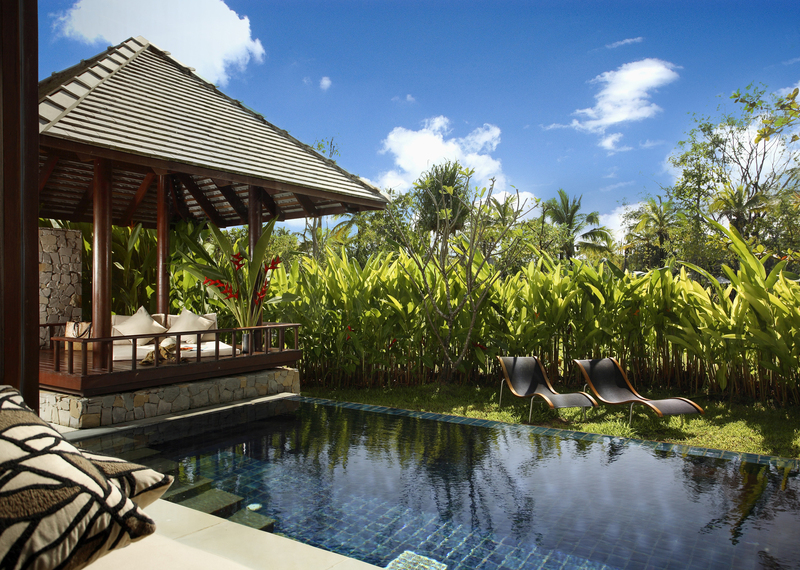 The resort’s true showstopper is the Olympic-size forest waterfall pool, enveloped by a landscaped water garden. Nestled under a leaf-shaped roof is Baba Shishi Lounge, which serves fabulous cocktails as the sun goes down. If you want to get in before the crowds descend, book in advance. Last but not least is Baba Nest – possibly the most impressive place in which I’ve enjoyed an espresso martini and one of the world’s most stylish and exclusive rooftop bars – with its wraparound infinity pool surrounds the rooftop deck overlooking 360° panoramic views. Whether you stay in Sra Panwa or not, Baba Nest is a must visit, but advance reservation is essential. For the health conscious, there’s a fully equipped fitness centre and gym, a boxing ring and two tennis courts, with a team of instructors on standby every day. The private beach and pier offer easy-access yachting for island hopping, ocean cruising or a spot of sea kayaking, whilst the stunning beach pool is made for lounging and impromptu cocktails. Sri Panwa is one of those deftly accomplished resorts that it’s virtually impossible to find fault with – the suites are otherwordly, the food is immense, and Baba Nest presents guests with one of the best views in all of Thailand. You could live in this place – and I wish I did. 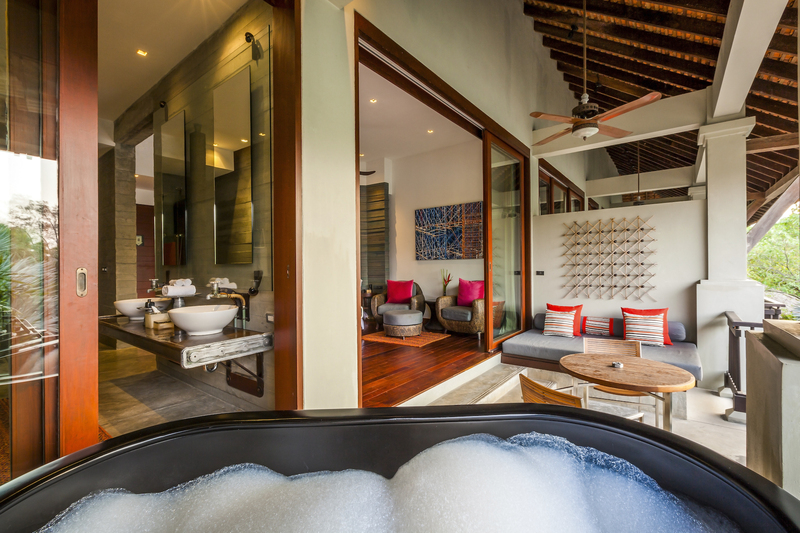 Sri Panwa offers accommodation from £325 per room, per night in the new Habita suite and £495 per room, per night in the Garden View Pool Villa, including B&B for two. 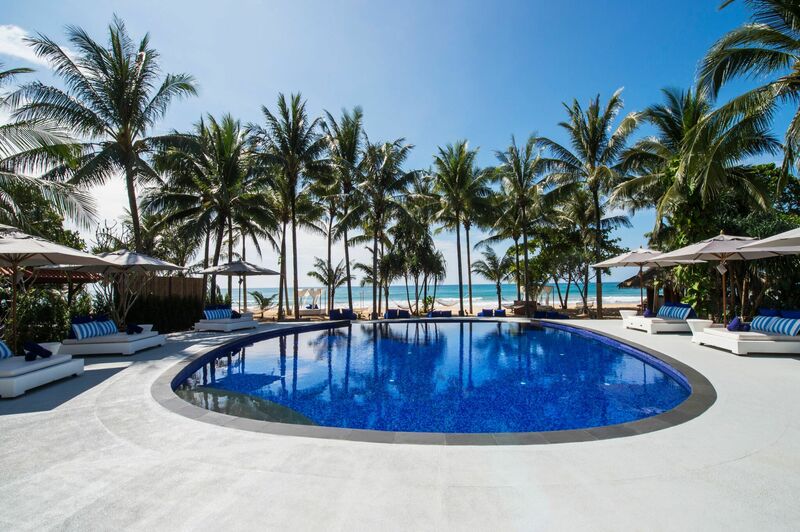 Sitting alongside the pristine sands of Natai Beach just 20 minutes north of Phuket International Airport, is boutique hotel akyra Beach Club Phuket. A sophisticated retreat on a secluded stretch of Thailand’s sunset coast with 58 stylish rooms, suites and villas complemented by lashings of in-room comforts and massage salas, the beachfront member of the akyra family offers visitors an eminently stylish escape. Meander through tropical gardens to find your secluded suite or luxury villa, where floor to ceiling glass windows let in the breathtaking views of swaying palm trees, white-sand beaches and azure skies. We stayed in one of the property’s expansive sea view villas, overlooking a free-form swimming pool nestled in tropical gardens and facing the beachfront, with clear views of the sparkling Andaman Sea. In the bedroom, an oversized king bed provided us with a glorious sleep, while a refreshing stint under the rain shower in the luxuriously appointed bathroom was a wonderful way to jump-start the day. Outside, the private terrace provided a sanctuary to enjoy an ice cold drink created by akyra’s master mixologist as the sun slipped below the horizon. Wellness is at the heart of the akyra experience, with daily yoga on the beach, beachside massages at sun-drenched spa Sala, pressed juices and net-fresh seafood sourced from neighbouring fishing villages, but what makes akyra so special is its activities and excursions. Unearth handmade jewellery and stunning textiles at the local markets, source ingredients for a cooking class with Head Chef Valerio Pachetti on a local seafishing excursion (lubricated with a few brews bought at the local pier, obviously), visit the Buddist Temples, scuba dive with leopard sharks alongside ancient shipwrecks, or borrow a hotel bike and explore the coastline. After a few days indulging in akyra’s activity programme, you’ll be longing for that sala lounger again. In the kitchen, Head Chef Valerio Pachetti – who has Colombian, Italian and German heritage – oversees the kitchens at akyra and its sister hotel Aleenta Resort, with delicious results. Expect fresh barbequed seafood on the beach (we became addicted to the calamari), deftly executed international faire at Club akyra, and deliciously creamy (and free) icecream served everyday at 3pm from the little ice cream parlour. Breakfast is served buffet-style, with hot and cold options plus a glass (or two) of bubbles, and the restaurant and beach bar serve nibbles and full plates evening, noon and night – waistlines beware. With its Ibiza-esque poolside beats and upscale blue-toned lighting around the pool area, the hotel takes on a European flavour when night falls, balancing its traditional Thai motifs with a contemporary, international ambience. If you want to truly immerse yourself in Thai culture with the benefits of all the mod-cons, this is the place to do it. akyra Beach Club Phuket’s prices start from £303 per night for a Garden Villa on an all inclusive basis (no alcohol included) during the month of November, based on 2 people sharing. Sleek, contemporary and almost inconceivably high-spec, this boutique five star hotel is an anomaly in its area and a marked departure from its part-Thai, part-Western competitors. Though portions of Phuket have been heavily commercialised on account of its airport, Kata Rocks sits in its own bubble of calm, strolling distance from the lapping waves and golden sands of Kata Beach, built into the cliff face above the rocky outcrop of Kata Rock itself. The outlook is genuinely jaw-dropping, with every villa, loft or penthouse offering a sweeping ocean vista. 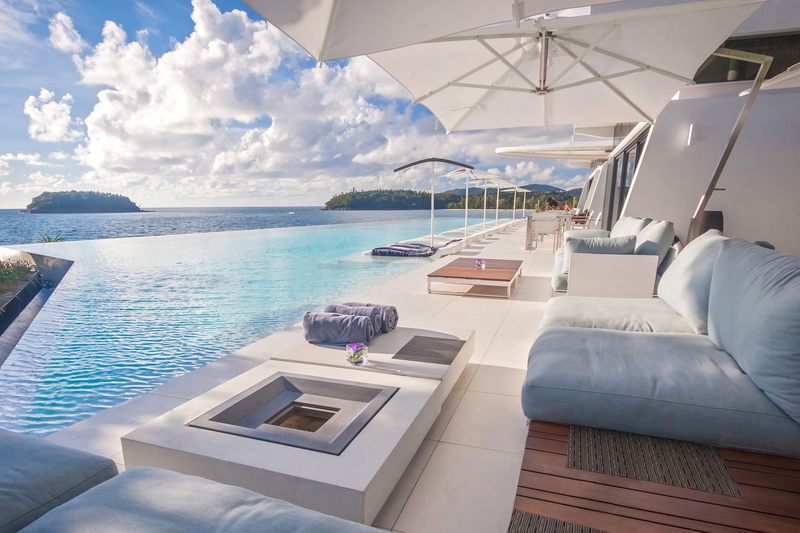 Our sky villa, like all of its neighbours, has its own western-facing private terrace and infinity pool, its crisp, white-on-white design giving the impression of a super yacht about to set sail across the shimmering Andaman Sea. Everything about the spacious interior is cool, calm and high spec, with an open plan kitchen and living area complete with glass worktops and state-of-the-art single touch control lighting and sound system. At the far end of the property, a cosy bedroom opens into a gleaming ensuite with a roomy tub and walk-in shower. Outside, the hotel’s grounds are characterised by undulating pathways, mirroring the steep inclines and sudden crevices of the cliff, flanked by immaculately maintained patches of greenery. If you don’t fancy walking, your personal concierge can arrange for a golf buggy to ferry you around. Don’t miss the eight room Infinite Luxury Spa, located to the north of the site, combining Thai wellness principles with the latest spa technology, including water massage beds and sleeping pods. By night, both the pool bar and restaurant boast spectacular sunsets, best enjoyed with a lycheetini laced with palm sugar. To round off your trip, book the lobster in-villa dining experience: locally sourced, market-fresh lobster, cooked by your own personal chef, and served on your terrace, while boats wink against the night sky. 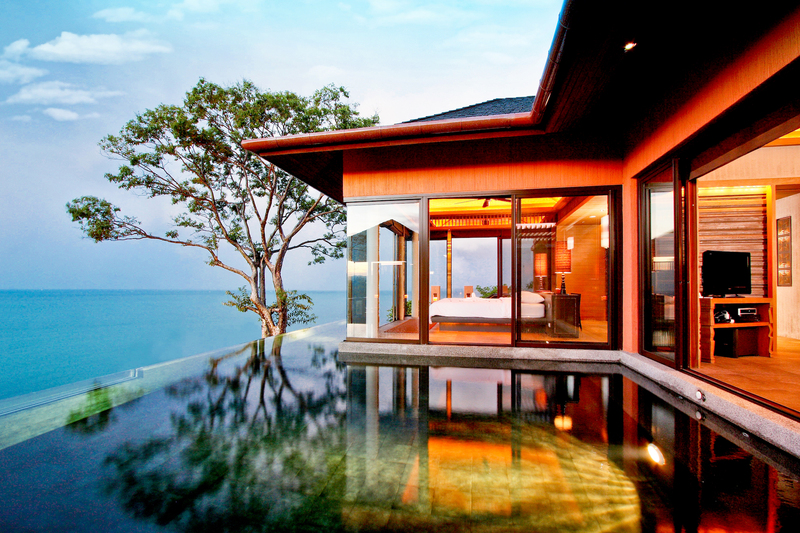 Kata Rocks Sky Villas start from £1,402 per night.